Finding the right pharmacy can be tough. Things like distance, accessibility, and product selection (or lack thereof) can make or break your pharmacy experience. Even though it seems like every pharmacy in the world is a CVS or a Walgreens, great independents still exist—you just have to transfer your prescriptions to them. If you’re strapped for time here’s the TL;DR: Call us and say you’d like to transfer your prescriptions or fill out our online form. We’ll get some basic information and take care of the rest! 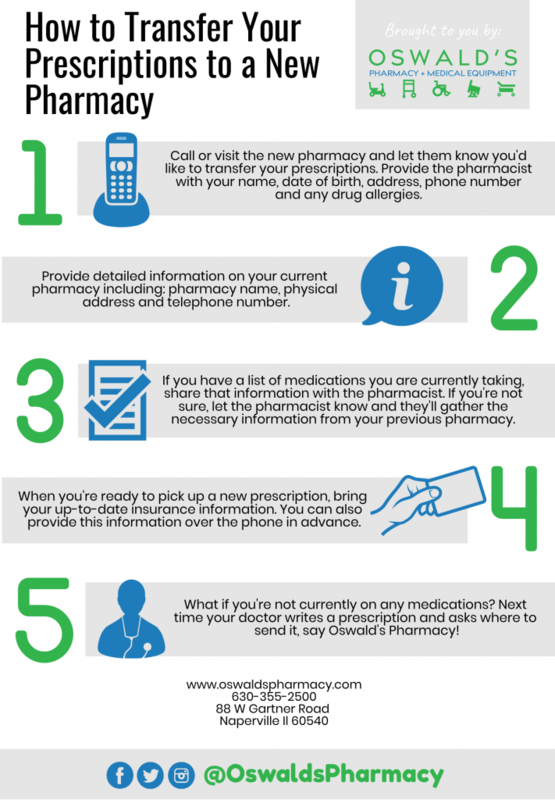 Call or visit the new pharmacy and let them know you’d like to transfer your prescriptions. Provide the pharmacist with your name, date of birth, address, phone number, and any drug allergies. Provide detailed information on your current pharmacy including pharmacy name, physical address and telephone number. If you have a list of medications you are currently taking, share that information with the pharmacist. If you’re not sure, let the pharmacist know and they’ll gather the necessary information from your previous pharmacy. When you’re ready to pick up a new prescription, bring your up-to-date insurance information. You can also provide this information over the phone in advance. What if you’re not currently on any medications? Next time your doctor writes a prescription and asks where to send it, tell them the pharmacy you would like to switch to (If you’re in Naperville, remember to say Oswald’s Pharmacy!). That’s the whole process! No messy break-ups with your ex-pharmacy—the new pharmacy will handle all of the information for you. If you live in Naperville, IL we encourage you to visit our store. We carry a huge curated selection of merchandise including Gift items, greeting cards, candy, toys, games, puzzles, candles and much more. Our store is over 15,000 sq ft—bigger than the average Walgreens—allowing our over-the-counter medications, beauty aids, vitamins, and first aid sections to offer many options. Many of our health care related sections are being updated with alternative natural and organic options, giving our customers an unrivaled selection. The Medical Equipment Showroom section of our store carries an unparalleled inventory of medical items. From compression hosiery to heavy-duty wheelchairs, and everything in between, our showroom was established to let customers try expensive medical equipment before they buy. Our medical equipment team has certifications from many manufacturers, allowing them to give you professional advice on the products you need. And don’t forget to stop by our pharmacy. For over 140 years our family business has been dedicated to improving the quality of life for our customers, employees, and community. At the end of the day, we are here to help you and we can do that better than the big chains. Why would you get your prescriptions filled anywhere else?